Saturday June 13 was the date of the 5th Annual, Lido 14, Fleet 2 Invitational held by South Coast Corinthian Yacht Club (SCCYC). The Lido is a very small boat, only 14 feet long. It was designed to be a family oriented day-sailer that seats as many as 6, dinghy sailors have found it a great boat to race with a crew of two. The boats weigh only about 300 pounds and are easily towed behind even small cars. Many of the local racers travel extensively between venues as far away as Huntington Lake in the High Sierras. For the race eighteen Lidos shared the main MDR channel with the visiting whale and a few dolphins trying to find the bow waves of the little boats. 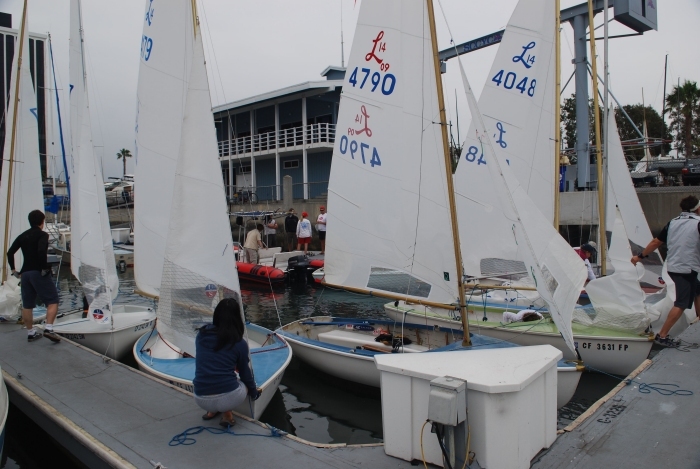 Local racers were joined by visiting boats from Mission Bay and Long Beach. Steve Arkle and his experienced race committee ran a great regatta. Steady breeze and square courses made for exciting, close and friendly competition. In the A fleet the top three boats were all within a point of each other until the end of the last race. The B Fleet all carried GPS transponders and after racing were able to compare their tracks for each race on the KATTACK race tracking program on the big screen at the club. The whole system was donated by Open Sailing. Mark Ryan and crew John McKielski, recognizable by the silly hats they wear to race, from ABYC (Alamitos Bay Yacht Club) won the A fleet. 2nd place went to Susie Taylor and Werner Horn from California YC, 3rd place was Kelly Cantley and Kevin Thomas from SCCYC. The B Fleet winners were Tracey Kenney and John Richardson from SCCYC. 2nd place in the Bs went to Erik and Davis Bakker a father son team from ABYC and 3rd place to Charles and Joanna Smith from SCCYC. The Bakkers also won the top rookie prize, for best finish of all the B fleeters who’ve been in the boat for less than a year. It would not be a real Lido race without at least one capsize. 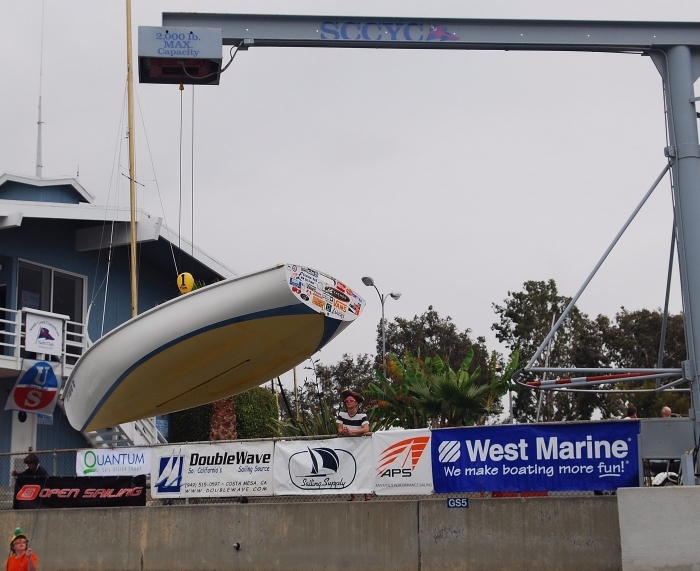 When all the racing was over and the completion of the fun race back to the club would spell the end of racing for the day, we had not seen one capsize. Peter Beale and his crew Matt Schultz took it upon themselves to turn the race into a “real” Lido race and initiated a capsize within view of the club dock. Peter and Matt actually were able to test the depth of the channel by sticking about two feet of the top of the mast in the mud. With two power boats standing by to offer assistance the two sailors were able to use well practiced maneuvers (Peter has done this before) to once again right the boat. They did accept a tow in and were only a little late to the party. Trophies and door prizes were generously donated by the following sponsors: Annapolis Performance Sailing, DoubleWave, Open Sailing, Quantum Sails, Red Pennant, Sailing Supply, Ullman Sails, West Marine and W.D. Schock Corp.
SCCYC will be hosting a few more Lido 14 events this summer. On June 21st the club will be “Open”. Visitors can meet some club members and take a test ride on a Lido. The re-inauguration of the Single Handed Lido Race on July 25th and later in the summer the club hosts the Outlook Trophy. The Outlook draws many Lidos and is open to all center board and multi hull boats under 20 feet. The Outlook, which will be held on August 23 rd, is a 14 mile race in small boats in the ocean for skippers and crews that are not afraid of getting wet.